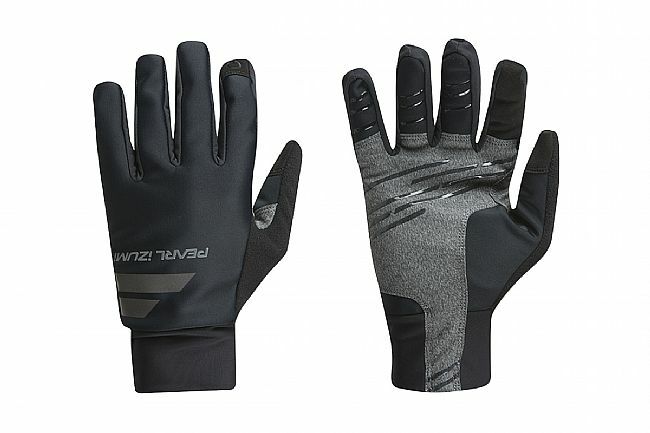 Pearl Izumi's Men's Escape Softshell Glove is fleece-lined for warmth with SELECT Softshell fabric on the outside for lightweight wind and water protection. Silicone striping across the palm enhances grip, while conductive synthetic leather ensures fuss-free touchscreen use. The longer elastic cuff helps keep wrists warm and the wind out by closing the gap between jacket and glove. Windproof, water-repellant SELECT Softshell external fabric. Conductive faux leather on index finger and thumb. Temp. Range: 35° to 40°F.